Sledding season is nearing the end around Whitecourt. Eagle River Staging Area is still open as trails are still rideable but snow is melting quickly. River and creek crossings are very wet and not recommended. Snow is better as you go north and west of Whitecourt. Some fresh snow north and west of town. Trails are better as you get away from town. Use caution on all trails and water crossings. Groomer may be out as conditions allow. The warm weather has taken a lot of snow away. Crossing rivers and creeks is not recommended. Grooming is done for the year and trail pass sales have discontinued. There is still some snow on trails from Eagle River Staging Area. Use caution on all trails and ride at your own risk. Trails are still in great shape with what seems to be an early Spring in the Whitecourt area. We received a few inches of snow over the last week but with the warm temps it definitely shrunk and it was a bit too warm for the groomer to do any good. Trails are still smooth but please be cautious of possible overflow on creek crossings after this warm week. 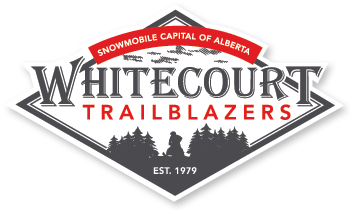 If you are out on the trails, please take some pictures and e-mail them to photos@whitecourttrailblazers.ca. Summit Trail to Summit Shelter and Goodwin Lake Trail were groomed this week. Also, the Golden Triangle Trail from Whitecourt to Virginia Hills Road was groomed. Grooming will continue as long as the conditions allow. Trails are in good condition.